Oddball Stocks: Gencor, selling below net cash, but is there more than meets the eye? Gencor, selling below net cash, but is there more than meets the eye? 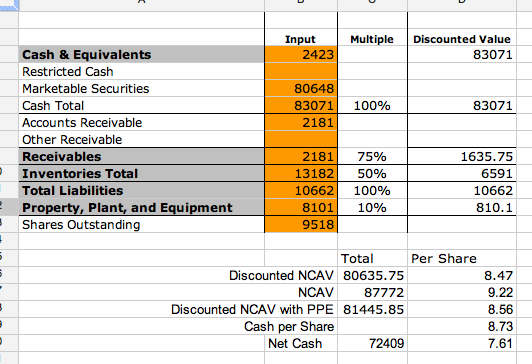 I saw this idea posted over at the ST Report, plugged the numbers into my net-net worksheet and realized this is a company selling for less than net cash in the US. I have to admit, at first glance when I saw this I was excited, it seemed like the type of company I like to hold, selling for less than cash and profitable. Basically every single net-net has a problem, it could be a small problem that looks big, or a big problem that looks small. The trick is identifying companies where the problem appears big but is really small or manageable. The first red flag for me was that Gencor didn't appear to have an obvious problem, when I see this I get worried. I want to examine this stock by looking at both the bull and bear case. One criticism against the history of profitability is that a lot of the profits come from the marketable securities and operating profits are a bit spottier. I can accept this argument, but since this is a net-cash stock we're discussing I think any profits are acceptable. So in summary the stock is extremely cheap, and has a positive ten year history of earning money. For the past ten years the balance sheet has only grown stronger. To put a conservative value on the stock I think it's fair to take the cash and securities at face value and add a 8x multiple to earnings. Taking this approach we have EPS of $.71 at 8x ($5.68) plus the $7.61 in net cash giving a value of $13.29, almost a double from this point. This is a true dollar selling for fifty cents! One thing I've really been concentrating on when examining investments is looking at why a company is cheap, and what sort of margin of safety exists. In the case of Gencor the margin of safety is the discount to the liquid assets, and the fact that the market is valuing the operations at nothing. The first thing I did was go Googling for why Gencor was cheap and most of the reasons I saw on the internet tied to the fact that the operating company had a spotty history of profitability and the business was a generally poor one. I can accept this argument but I think it's a bit too simplistic. There are many poor businesses selling with high multiples, there are even many more businesses that have never turned a profit that are selling well above asset value. 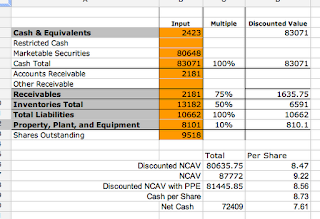 I believe there are multiple reasons behind the valuation discount at Gencor, I want to break each down individually. First off I want to state that the bear case has been made much simpler thanks to American tax payer dollars, the SEC has asked extensive questions of the company all recorded through EDGAR. Some of the questions are basic, others dig into nitty gritty accounting details. 1) What exactly is happening with the CFO? - This might not be the most important issue, but it raised the biggest red flag for me, in the past three years the company has had a total of five people in the CFO position, two actual CFO's, two interim CFOs, and one acting CFO. I should also note that the company failed to file an 8-k on multiple occasions when a CFO or acting/interim CFO left. It's odd to me that none of the interim CFO's became full time, and the length of tenure is frightening. I don't know many people who are hired at a company and feel that in five or six months they've made such an impact that they're ready to move on. Usually people who move on quickly do so because they realize they are not a good fit at the company, or they feel they're unable to fulfill the role. There could be a perfectly valid reason for each CFO leaving, but in total there appears to be a pattern here that's concerning to a potential investor. 2) What is the purpose of the cash? - For any company that is cash rich there is always the possibility that management could squander the cash on failed acquisitions or just plain bungle things destroying shareholder value(MSFT...). In a response to the SEC the company states that "The “Acquisition Fund” is an amount of cash accumulated over years by the Company and intended to support its operations, as well as to be used in and when an appropriate acquisition becomes available." A response like this is concerning because my margin of safety is the fact that the company can liquidate and return cash in excess of my purchase price. If the company is planning on using the cash to purchase another company my margin of safety could be destroyed by bad capital allocation. This is a big risk, and while an acquisition hasn't happened yet it doesn't mean that it's impossible either. 3) Is Gencore an investment company? - In a few of the letters the questioning from the SEC revolves around the idea that Gencor should be classified as an investment company. The company responds saying they have an engineering bent, and are focused on driving operations. The SEC response is that while it's nice Gencor is focused on operations a potential investor isn't getting an engineering company they're actually purchasing an opaque securities portfolio. What's interesting on this point is the SEC says they disagree with the company's classification and basically say they aren't going to argue the point further. This is a potential risk, investment companies have much different and more stringent regulations than public companies. Any sort of action by the SEC to classify Gencor as an investment company might force management to unload the marketable securities portfolio; a possibility is a dividend, or a terrible acquisition. Based on the companies stated purpose for the cash I'd wager a shotgun acquisition is more likely. 4) Questionable receivables accounting - Each of the above items I was able to somewhat justify away but when I hit this item it killed the thesis and shed some light on a possible reason why the company has been through five CFO's recently. The company claims in filings that "the majority of company sales require payments of cash before shipping" and then go on to claim that approximately 47% of accounts receivable are flagged as a doubtful accounts. So right now something should be clicking saying that if customers are required to pay in cash upfront how can 47% of receivables be in question? I'm not exactly sure, and the company never fully explained it to the SEC's satisfaction either. Either the majority didn't actually pay upfront in cash, or 100% of the non-majority hasn't paid at all. Given that 47% is less than a majority I'm leaning towards the notion that most or all of the non-prepaid customer have paid a dime. That brings us to the next issue which is the status on the doubtful accounts. Gencor claims to extend credit to clients in the form of receivables financing. What this means is that a customer can contract for a job and not pay until the job is done, or after the job is done and pay a small interest charge to Gencore. For Gencore this is considered an account receivable, and as noted above most of those receivables financed are outstanding and according to the filing notes are 90 days past due. The company states that they are slow to write down bad debts because they continue to hold out hope that the client will eventually pay. And if they think the client will pay eventually it shouldn't be considered a bad debt. The logic of this defies me, the company seems to believe the if a client hasn't paid in 180 days but claims the check is in the mail that the receivable is money good. Edit: I forgot to put this in the article originally but from the most recent annual report the auditors did not review internal controls whereas in the past they had. Management was asked by the SEC to include a note to this effect and to certify according to management that the internal controls were sound. I know there are more items lurking in the accounting, and a few of them are detailed here, here and here in the SEC letters. But after hitting the four above items I decided to move on from Gencor. I recognize the company is cheap but I think there are very good reasons for the cheapness, and I think the margin of safety is an illusion with Gencor. I'm interested in hearing holes in my thinking or answers to the bear questions. 5 cfos in 3 years and the current acting cfo is the son of the controlling shareholder? no decline in investment portfolio in 2008? do you know which equities they are holding? Thanks for the comment, about the investment portfolio the company states the equities are managed by a professional but no further information is given. Of the marketable securities a good portion is composed of muni bonds. The company went from an almost 100% bond position to a 40% equity position over the past few years. Your comment about no loss in 2008 got me thinking, so I went back and looked at the 2009 10-k. At the time they had $57m in marketable securities and recorded a $2.4m loss, or down about 4%. In 2008 they had $53m in securities and a loss of $5.9m or about 11%. Also of note in 2008 the portfolio turned over a bit more than 100% and in 2009 it turned over about 95%. I'd be interested in knowing who their manager is who can turn over a portfolio that only be down 14% when the market in general was down 25% over the same period of time. in 2011 they go into mutual funds and their municipal bonds are suddenly level 2 instead of level 1? The movement from L1 to L2 was a bit strange for the bonds. Also what is strange is the justification for it. The SEC argued that muni bond quotes are available through S&P and there's no reason they should be L2. I don't know much about the synthetic plant project, but I am going to dig in a bit further. There were too many things that individually could probably be justified but as a whole I can't justify investing in Gencor even with the mount of cash and assets. What do you think about the growth potential that could be realized with the passing of a new Highway Bill in March or next September? Our roads are in terrible shape and estimates say that 25% of our roads in cities need to be replaced within 2 years. Asphalt is the standard in Road Construction and with increased funding (no BS like the Recovery act that only supplemented state budgets and failed at that) would you not see a large increase in Revenue and with such high demand and the efficiency in making more asphalt plants, wouldn't they actually become profitable and make around $8-10M in earnings per year (around $1 EPS)? This could make the company itself worth upwards of $10-15 per share and with the portfolio as a margin of safety in addition to the fully depreciated assets still in use (at least $10M worth) wouldn't this be an awesome investment? Gencor's management (and large shareholders) would not benefit by a shotgun spray acquisition but would definitely prefer a large dividend. Also as the Chairman and CEO E.J. Elliot moves past 82 years old, what do you think about the possibly ownership conflict between his sons? One is the current CFO and owns a good bit and the other is a former director who is older and may be higher on the inheritance list.